Hit Your Energy Bills for Six! Home / About us / Hit Your Energy Bills for Six! Why we’re putting our energy into energy rated homes. 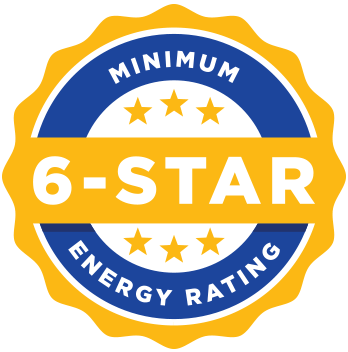 With GO Homes guaranteed minimum 6 Star energy rating on every home, you’ll save where it matters most – in your back pocket. GO Homes is leading the industry in Western Australia by designing and building new homes that guarantee to meet the NatHERS 6 Star energy rating. That’s because at GO Homes, we believe in future-proofing your investment – giving you a home that’s efficiently designed and sustainably built. In regards to approval methods other than a NatHERS 6 Star rating, the Building Commission stated in 2013 that, “There are other ways of gaining compliance and approval for energy efficiency [such as via VURB] and although these aim to be equivalent to 6 star, this is not always the case. Therefore it is possible for your house to meet the BCA requirements but not be rated 6 star” – Building Commission, 2013. Further, the CSIRO in July 2017 issued a caution against using VURB where NatHERS software is used as the reference guide. In these circumstances, the CSIRO said that it “…may lead to poor comfort and energy performance in the finished dwelling.” – CSIRO, 2017.